In 2015, after losing the matriarch in our family, Jessie; I went online to look at the kitties that were up for adoption. I found this beautiful boy named Sushi and Mark and I both agreed he had a special face. I contacted the agency and they said that the adoption process included a home visit and then afterwards they would decide if you and your home were acceptable for placement. They brought Sushi to the house….took one look at us, the house, our other kitties and in two minutes they said he was ours and they walked out of the door. He walked out of the carrier…..or I should say “lumbered” out of the carrier and declared that it was his house. Our first order of business was to get rid of the name Sushi (it was so wrong) and we decided on Duncan. Don’t ask me why, but it just fit. All boy and more like a dog than a cat, Duncan was very smart. He came when you called him (most of the time) and he was always at the door to greet you when you came home. Being a big boy, breakfast was his favorite time of the day. Many a morning I was yelled at, telling me it’s time to eat. And how could you refuse??! He loved to talk, loved to wrassle and loved to go outside on the back patio to watch the world go by. When it came to birds and other creatures he had no instinct whatsoever on what being a cat meant, which was incredibly charming. When outside on the patio the birds would flit around him…he was more frightened by them then they were of him. And as prince of the household, while our two girls, Francie and Lily weren’t the best of friends, they both loved Duncan and treated him like their little brother who could do no wrong. 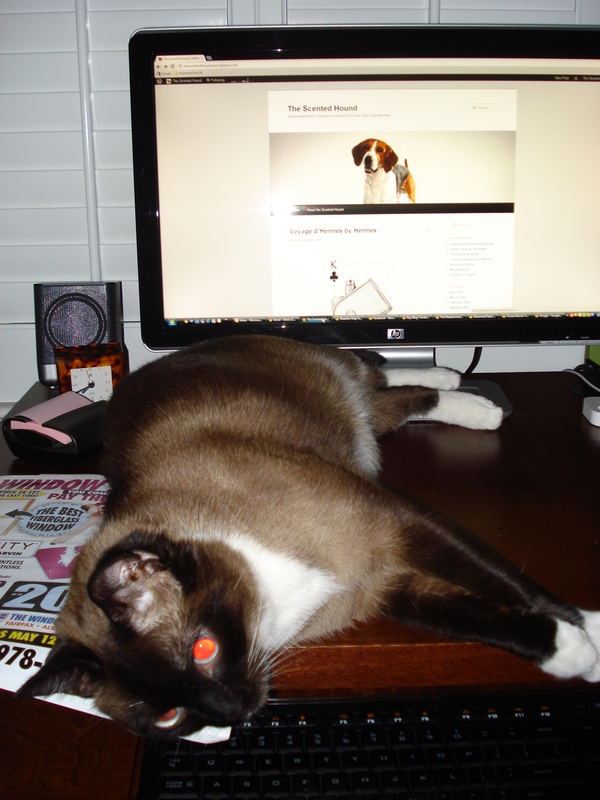 Duncan was also an integral part of this blog. When writing many of my posts when we were still in the States, Duncan would make himself at home on my desk and keyboard and would get between me and what I was doing making it hard for me to write. Perfume samples would get strewn and packages were perfect for lying on. I didn’t mind. He was happy. When we moved to Mexico, for the first few months he lived in the bathroom of our rental house. It was cool and apparently safe and we were worried if he would ever adapt. Of course, we needn’t have worried. Just last month we had a Christmas party with around 40 people in attendance and Mr. Charming sat by the front door and greeted everyone. It’s hard to believe that just one month later, he’s gone. A major love bug as he aged, Duncan was one of kind…of course all animals are…but he really was special and will be greatly missed and I look forward to seeing him again some day. Goodnight my sweet prince and most beautiful of boys, you made our lives more special than you will ever know. Categories: Uncategorized | Tags: Duncan | Permalink. It seems these days as soon as I sit down to my computer, my sweet and special boy Duncan joins me which makes doing anything on the computer impossible. Yes, it’s obvious that I live in his world and his needs comes first. To be honest, I wouldn’t have it any other way.